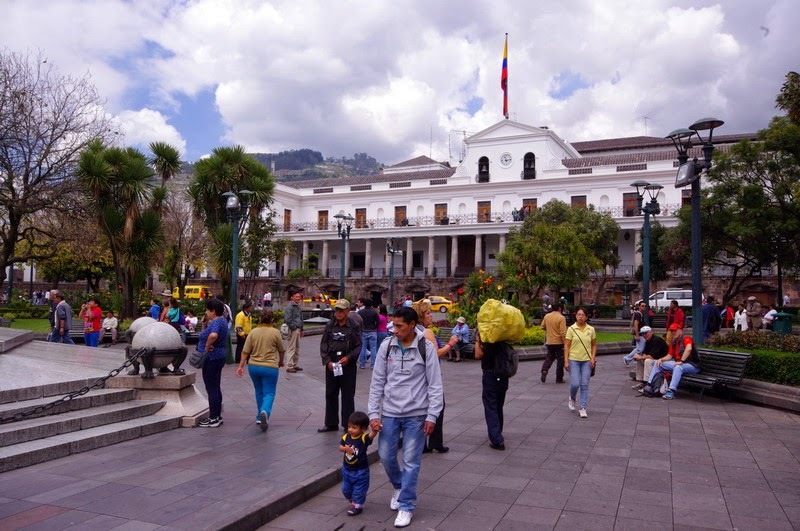 Quito is the capital of Ecuador, and at an altitude of 2,800 meters above sea level in the Andes. This is the highest capital city in the world. Quito is located in the north-central Ecuadorved Guayllabamba river on the eastern slopes of the Pichincha volcano, an active stratovolcano in the Andes. The city has a population of 2 million and is about 60km long but only about 5 km wide as the city is sandwiched between two mountain ranges - the Western and the Eastern Andes mountains. Because of the long and narrow city between steep mountains and the river that cuts through the city in a deep canyon transport metrics of hopeless - then takes about 2 hours to get in and out of town. From the city can be seen several volcanoes. The closest volcano is Pichincha, which rises looming over the western side of the city with a total of 4,794 meters. Quito is also the only capital in the world to be directly threatened by an active volcano. Pichincha volcano has several sister volcanoes, among them Rucu Pichincha at 4,700 meters above sea level and Guagua Pichincha at 4,794 meters which is an active volcano. The largest eruption occurred in 1660 when a layer of 25 centimeters of ash covered the city. There were three minor eruptions in the 19th century. The latest eruption was recorded on 5th October 1999 with a few puffs of smoke and a large amount of ash fell over on the town. East of Quito are the volcanoes Cotopaxi , Sincholagua , Antisana and Cayambe.